The score is 2-2. Arsenal end the first half having come from behind to cancel out Tottenham Hotspur’s lead. Five minutes into the second half, Tomas Rosicky receives the ball from goal-scorer Robin van Persie near the center circle, dribbles and sprays a pass to an overlapping Bacary Sagna before making a darting run into the 18-yard box. The French defender puts in a low cross that he guides into the net past Brad Friedel with so much ease that he manages to make it look effortless. His celebration reeks of pure passion. Even Indian Super League legend Andre Santos has scored a belter in a high-scoring London derby, but his history with local rivals Tottenham means he’s endeared himself to the Emirates Stadium faithful in a way that only they can understand. As luck would have it, most of his sublime goals came against the Lilywhites, with his second-minute rocket in the 1-0 win at White Hart Lane in March 2014 and chip over Hugo Lloris at home in an FA Cup fixture two months earlier all highlighting how superbly Rosicky performed against them. However, it takes more than just on-field heroics to make oneself a club’s bogeyman, as he often slagged them off during interviews, like professional footballers never do. “The best thing about London is Arsenal. 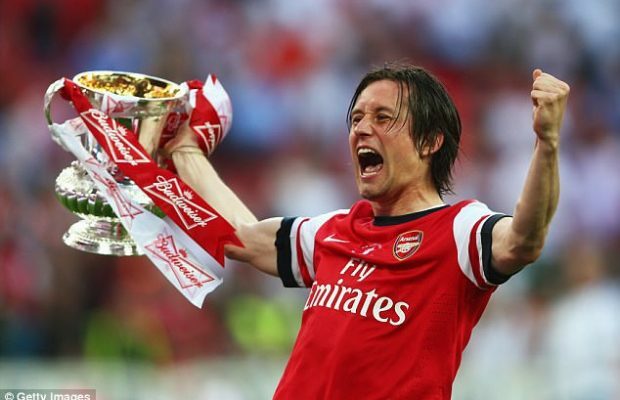 The worst thing in London is Tottenham,” Rosicky said, looking characteristically calm in an interview with Arsenal YouTube, and that only solidified his cult hero status that he had acquired during his 10-year stay at Arsenal. However, his bantering Tottenham off was only the cherry on top, for his playing career and the impact he’s had warrants legend status already. Signing for Arsenal in May 2006 for £6.8 million – a fraction of the Bundesliga record fee Borussia Dortmund had paid Sparta Prague in 2001 – he racked up 37 appearances across all competitions in a team that also boasted Cesc Fabregas, Aleksandr Hleb and Freddie Ljungberg. At the end of his first season at Arsenal, he had collected six goals and four assists, but the Arsenal fans had fallen in love with the long-haired artist they fondly call Mozart after witnessing a few of his trademark slide tackles and outside-the-boot passes. Finally accustomed to the rigours of the English game, Rosicky had a flying start to his second season, scoring six goals in 18 appearances, but a knee injury in January 2008 meant he didn’t only miss the remainder of the season but also the entirety of the 2008-09 campaign. Although his 2009-10 campaign saw him clock over 1770 minutes, he never returned to old self again, and his attempts at realizing his potential often met hurdles in the form of injuries. In fact, he sat out over 155 competitive games for Arsenal, as he inhabited the treatment room for over 1000 days during his Arsenal tenure. However, whenever he started or came on as a substitute, he managed to inject energy and life into the team. During the period when Arsenal had to make-do with the likes of Gervinho and Marouane Chamakh, he came across as a beacon of light, as he essentially made Arsenal play quicker, more attractive and more incisive than they’d do without him on the pitch. Plus, helping out youngsters such as Thomas Eisfeld and Serge Gnabry who had grown up idolizing him, he helped the club out in more ways than one in times of hardships. He didn’t just have an impact on the youngsters, though, as he seemed to positively influence players many see are superior to him in terms of talent such as Mesut Ozil. His loyalty, in particular, has been unrivalled, at least in the past decade, as he turned down many big-money offers, including a few from cash-rich Russian Football Premier League and Chinese Super League clubs to stay with the Gunners despite limited playing time and smaller payday. Arsenal manager Arsene Wenger admitted his frustration about his being unable to utilize him as much as he might have fancied, when he left the club. However, the words he used to describe his former player clearly underlined his respect for him. He may not be remembered by casual observers in a few years’ time thanks to his injury-riddled career, but he, Arsenal’s own rock-star, will surely be one of the coolest footballers football hipsters think about when looking back at Arsenal of the noughties.